The family budget plays an important role in planning a family vacation. It’s good common sense to save money, but other times, it’s just as good to live a little and splurge. Disney vacations are known for magical memories and a hefty price tag. 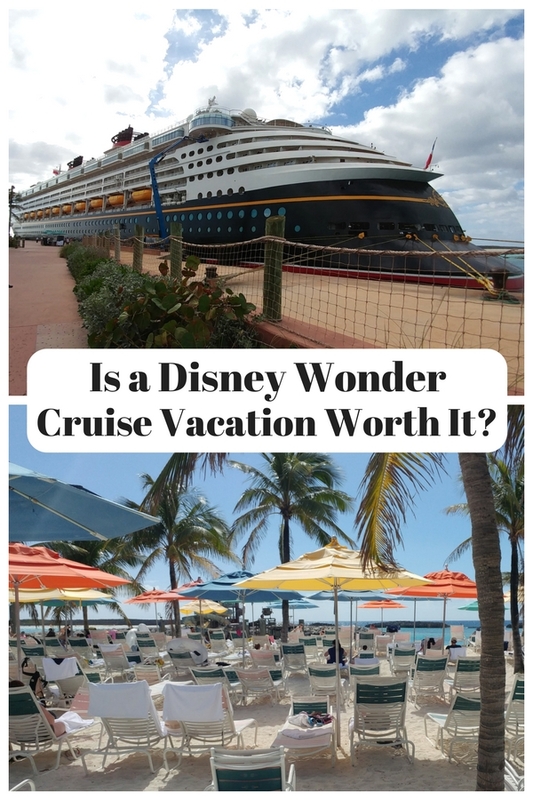 So when deciding on a cruise vacation, is a Disney Wonder cruise worth the splurge? A family vacation aboard a Disney Cruise Line is typically out of financial reach of my family. But I strongly considered the opportunity to splurge as an attendee of the 2017 Disney Social Media Moms Celebration. Part of the conference included a 3-day cruise aboard the newly refurbished Disney Wonder cruise ship with my family. At first, I couldn’t help but worry. Was this a wise splurge on my part? When I do the family budget, I heavily weigh wants versus needs. In the end, on account of a very rare opportunity, I decided to go. For me, the biggest hassles on long-distance family travels are luggage and transportation. With several moving parts to our trip, Disney gets the travel details, especially with luggage. My mother flew in from Kansas and came to our hotel via The Magical Express, Disney’s complimentary shuttle bus. She also didn’t have to worry about her bags because Disney took care of that too. After checking her bags at the airport with special luggage tags, they were delivered straight to our hotel room. She didn’t need to worry about baggage claim or lugging around heavy suitcases, only her carry-on. 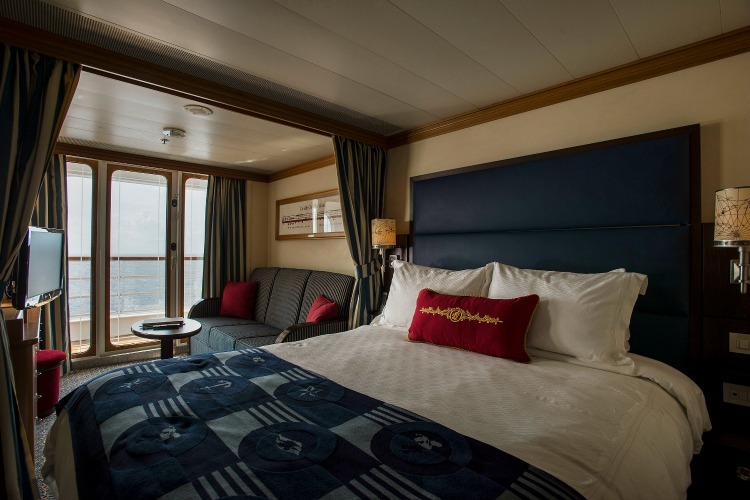 Additionally, when we moved from the resort to the cruise ship a few days later, we arranged for Disney to pick up our luggage from our hotel room and deliver straight to our stateroom door aboard the Disney Wonder cruise ship. It was a big relief to only carry purses and backpacks as we checked in to board the ship. 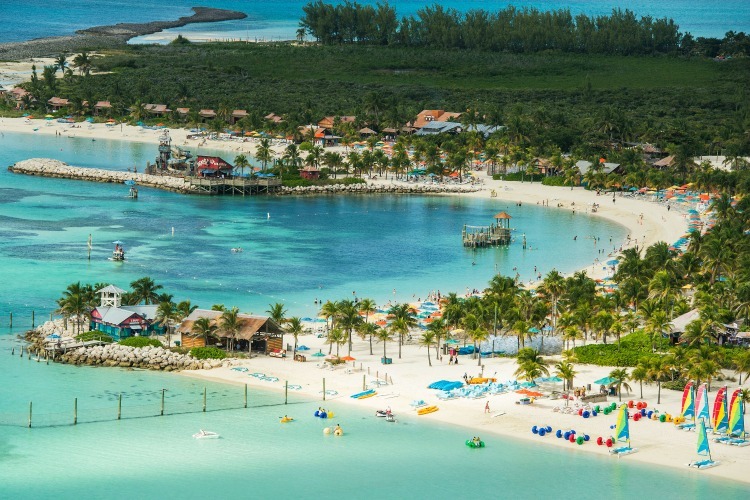 Disney has its own private island in the Bahamas, Castaway Cay (pronounced “key”). This beautiful, white sand island offers activities to keep you entertained all day. See stingrays, rent bicycles, run a 5K race, nap in a hammock. or just spend a lazy day on the beach, which is what we did. It was my 4-year-old’s first time in the ocean and what a joy to watch. He hunted for shells, played in the sand, splashed in the water, and chased birds on the beach. You can also browse through a few souvenir shops and eat tasty barbecue, fruits, and ice cream from the all-inclusive restaurant. No one is more paranoid than I am when it comes to childcare. I researched this at length before signing on for the trip because I thought it would be nice to do a few things with just my mom. The kids loved both play areas, In fact, when they spotted us at the front desk to pick them up, they were disappointed and didn’t want to leave. I loved it too, and I’m a hard sell so you know it’s true! There is an open house so families can come in and check out the area to make sure it’s a place where everyone is comfortable. You will fill out registration paperwork with family and care information for each child. Children receive a wristband to scan at check-in and pick-up. They will take a photo of you and your child and set up a password as an extra level of security at pick-up. There are 2 different drop-off points: The Oceaneer Club and the Oceaneer Lab. Kids are welcome at either side and they are connected, so it’s easy for kids to explore both. Everyone is asked to wash hands with soap and water at check-in before joining play areas. They are open until midnight. We did let them stay late on our last night at sea so we could get the room packed up for departure the next day, which was nice. Be sure to watch the video for a closer look at the huge play areas! My mother and I joked that after the kids and grandkids are all grown and gone that we are going to become ladies of leisure on cruise ships! The food we had was top-notch, serious parties in your mouth and atmosphere. 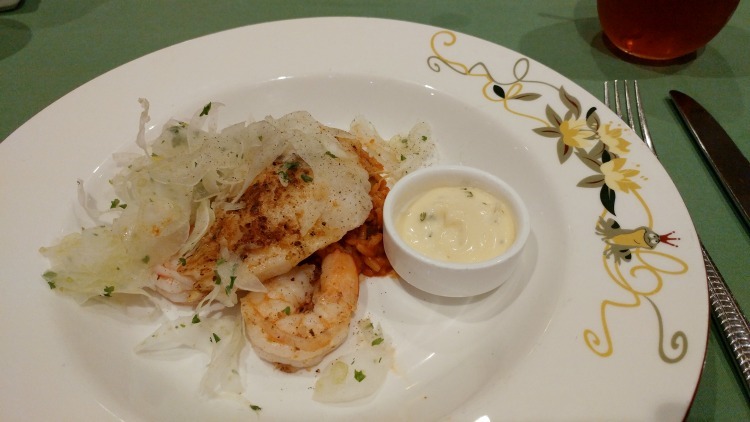 We loved the restaurants on board: Animator’s Palate, Tiana’s Place and Triton’s. I felt a lot like Pretty Woman at first in regards to which fork to use when. But I never felt bad and always received courteous, professional service. We had the same servers for each meal at rotating restaurants, and I’m certain they’ve seen it all by now! One night we decided to skip the fancy dinner and hang out with the kids at the pool, an added benefit of an all-inclusive cruise. We also loved the variety of simpler, a la carte options by the pool like pizza, strawberries and sandwiches, and of course complimentary ice cream. After each evening enjoying the ships entertainment, we returned to our room to find our beds turned down and the boys’ bunk beds set up, and always a little surprise or two. 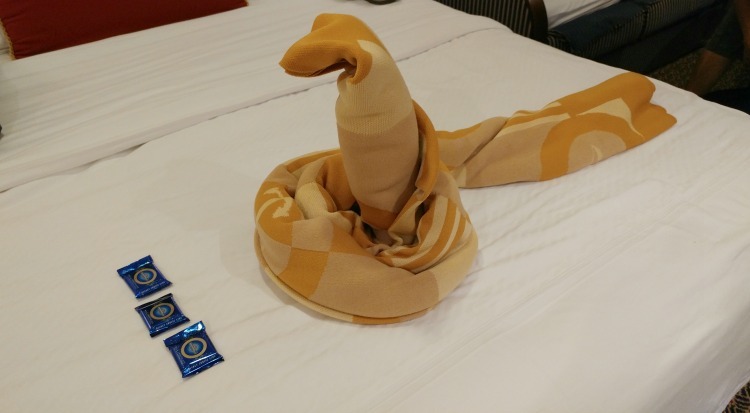 We loved the serpent and chocolates after we returned to our stateroom from Pirate Night. We came to know several familiar faces and felt like we were always well cared for. Customer service is so dead these days, it was refreshing to get the royal treatment! Two words that I never thought would ever come out of my mouth: amazing puppetry. 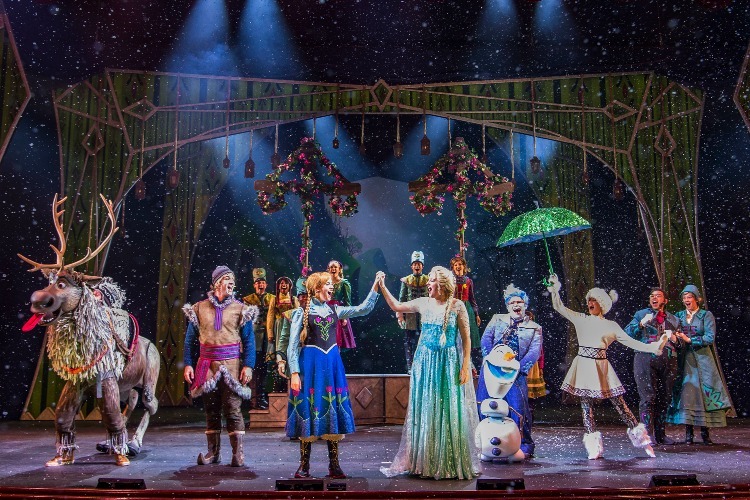 I am not much of a princess fan, but this tomboy-ish boymom of two gave Frozen: A Musical Spectacular a big fat standing ovation. We also enjoyed the Golden Mickeys, a show that highlights snippets of famous Disney tales like Sleeping Beauty, 101 Dalmations, and the Princess and the Frog. I was very impressed with the Broadway-caliber entertainment aboard the Disney Wonder. 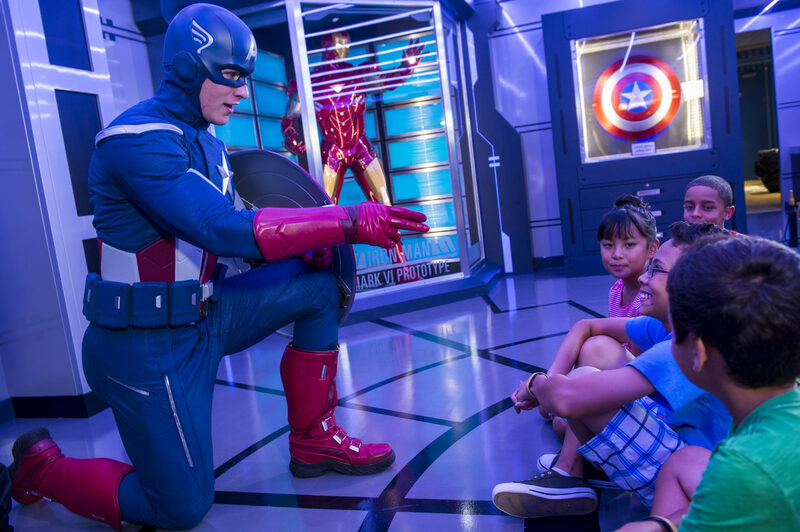 The ships entertainment no doubt enhances guest passions for character meet-and-greets, just fyi! We mostly hung out with the kids so we didn’t experience the adults-only areas, but they are certainly there. 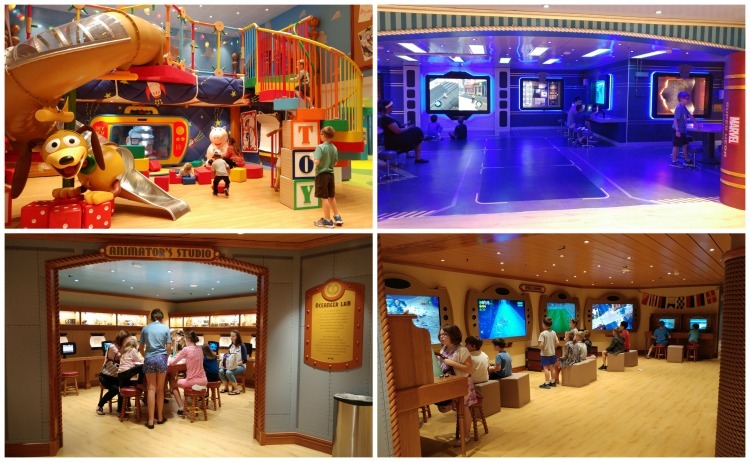 For information on the private pool, adults-only beach location, Palo restaurant, clubs and drinks check out Do-it-All TravelingMom’s post: 7 Of The Best Reasons To Take A Kid Free Vacation on a Walt Disney Cruise. Pirate night, what can I say? 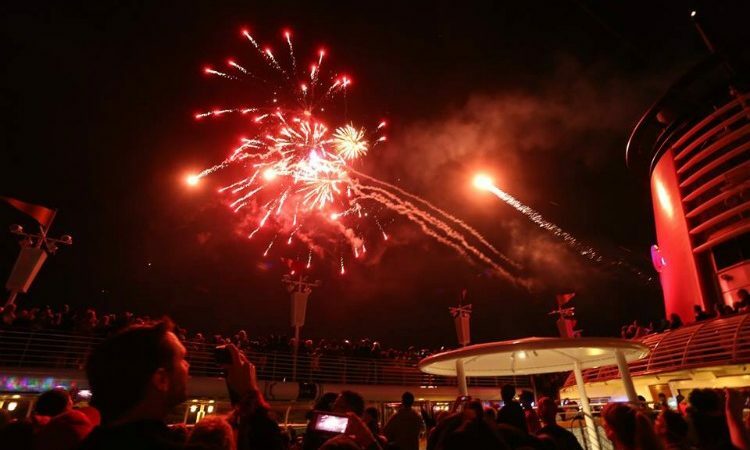 It was a fun dress-up dance party with characters on stage topped off by the only fireworks at sea aboard the Disney Wonder. Check out the video below to see the finale! 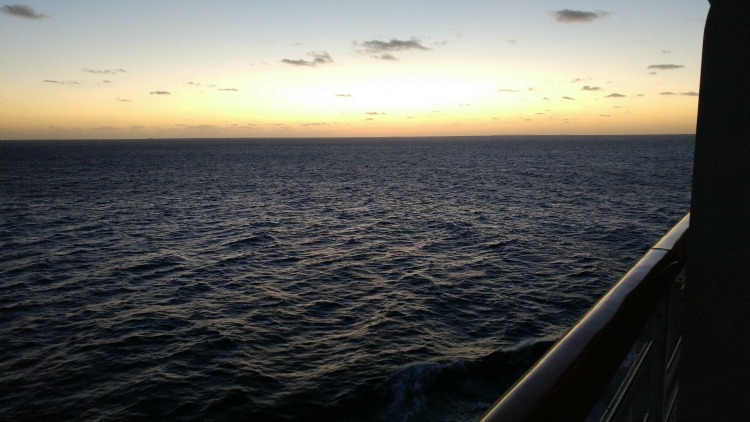 The views of the ocean are stunning at sunrise, sunset and everywhere in between. I saw beauty everywhere, on deck, from my room, restaurants and certainly on the island. In the end, it was a world-class vacation at the hands of Disney. It will take time for us to be able to do it again, but I would gladly go and know it’s every bit worth the splurge. 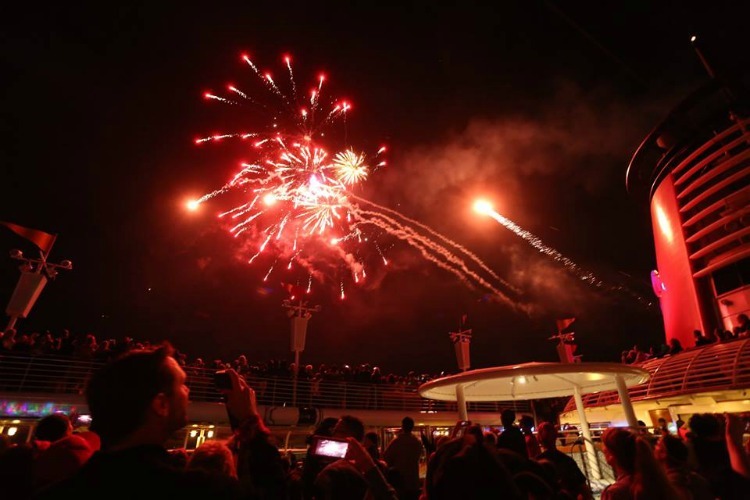 Watch this short video of life aboard the Disney Wonder!